For the Class of 2016, this can be both a stressful and exciting time of year. With the college process and applications nearing their end, we are excited to announce that several of our graduating seniors have signed to row in college at some outstanding programs! The hard work of the last few years, both on and off the water, has really payed off for these athletes and we are proud that they get to represent us at the next level. Aine McGinn, class of 2016 from Saint Cecilia Academy, as well as Eden Norris, class of 2016 from Brentwood High School have both signed with the University of Texas to row and be a part of one of the fastest growing programs in D1. We know that they will represent Nashville, and now Texas well and continue to push each other as they get to be teammates for a few more years! Michele Holtkamp, class of 2016 from Brentwood High School, has committed to row at Stanford University in California. With a long history of success, and no signs of slowing down, Stanford is an extremely competitive program at one of the best schools in the country. We know that Michele will excel in the classroom and on the water as she joins the team next fall! Be sure to check back in for updates as more athletes make their college decisions. The coaches, and all of Nashville Rowing is so proud of this senior class, and know that their legacy will be one that guides future generations of Nashville Rowers. Spring 2016 marks the second year of the Tennessee Sprint Series between some of the major club and scholastic programs from TN and even a few bordering states. We are excited to continue seeing rowing and competition grow and take route in our Southeast region as the results get posted on Row2k. TN Sprint Series #1 was held at Oak Ridge Rowing Center on Saturday March 19th, which made for an excellent start to the season on their buoyed course. Many months of winter training and a cold beginning to Spring were put in to high volume racing where some athletes raced 2-3 times across boat classes. The opportunity to line up next to crews from Atomic Juniors, Asheville Youth, ETRO, and even some of their own teammates was a welcome chance to take a first shot at competitive 2000 meters outside our own practices. With even conditions, and only a headwind for the last few races of the day, the coaches were very happy to be able to set a baseline speed for many of these crews that will continue racing throughout the Spring. TN Sprint Series #2 was hosted here at Percy Priest Lake and featured some familiar faces, along with a few new additions to the racing lineup. Nashville Rowing Masters and Juniors, ETRO, MBA, McCallie, GPS, Rocket City Masters, and Row Huntsville all piled into the parking lot for a great day of racing. Despite the very strong westerly winds, we were able to successfully complete all races with the exception of some of the later 2- and 2x boats. This was a great opportunity to race at home, and work to improve on previous weekends racing and all the meters logged at practice since. Thank you to all the Nashville Rowing volunteers who worked to set up, break down, and make sure everything in between ran smoothly. As always, these days would not run as well as they do without all of your efforts! Any parents or spectators that have pictures from these races, or others for that matter, please send them to Coach Cory (cory@nashvillerowing.org) so that he can add them to the articles and our team Flickr account. With all the boats launching and docking, it has become much more difficult for him to play paparazzi during regattas as well! Saturday February 13th saw the first run of the Music City Erg Sprints, hosted at the Harpeth Hall School Athletic Center. Both Masters and Juniors alike showed up to put down one more Indoor Erg Race before we get back on the water for spring (fingers crossed!). The energy was high, and there were some great races with close finishes in several events. All of the juniors athletes participated in a Heats and Finals progression, in preparation to push our training towards the structure of spring races. Both the coaches and spectators were impressed with how the athletes were able to handle the race structure of the morning, and felt that they really exhibited the work they have put in this winter. Many found new depths to their strength and endurance, and have their sights set on loftier goals for the upcoming spring season. We look forward to expanding the scope of this race for years to come, so get ready to race next year! A special thanks for all the hands that made for such a quick clean up after the event was over, it is greatly appreciated by the coaches! More photos from the morning can be seen on our Flickr as well! Check out the TN Indoor Erg Championship Article to see how we captures the Youth AND Club Overall Points trophies for a second year in a row! Saturday January 30th started off for most of the Nashville Rowing athletes with an early drive down to UT Chattanooga for the 2016 Tennessee Indoor Rowing Championships. Both Masters and Juniors athletes proved that they have been working hard this winter season with 74 entries across the day, and a solid 29 medals! That number includes the Overall Youth and Club points trophies for the second time in two years! We are extremely proud of all our athletes, they showed up ready to work hard and represent Music City in strong fashion. Thank you to all the family and friends that made the trip to the UTC gym as well. The cheering section grows every year, and always breaths some fire into the athletes competing on the floor as they enter that last 500! 2015: Annual Meeting Brings Boathouse News! This year's Annual Membership Meeting was held on Saturday November 14th at the Bridge Building overlooking the Cumberland River and a beautiful view of downtown Nashville. The meeting was a time to come together as a group to look at the past year's progress, as well as look forward at the exciting future of Nashville Rowing before us! We saw the departure of four board members whose two year terms had come to a close. A huge thanks to Don Sullivan, Dawn Foster, David Franklin and Anne Campbell who have all served the board and the club's membership in several capacities over the last few years. Maggie Davidson and Mike Alles also finished their terms as the Masters Advisory and Juniors Advisory Committee chairs respectively. We welcome many new faces to both the Board of Directors and the Advisory Committees after all the membership votes were tallied. Joining the Board of Directors is Will Weaver, Dietmar Kuttelwascher, Maggie Davidson and Mike Alles. Joining the Juniors Advisory Committee is Christi Grant, Denise Alles, and Jamie Kyne. Joining the Masters Advisory Committee is Bethany Primrose, Emy Noel and Meg Mazzone. We look forward to the input of all of these new faces as we move into some exciting times to come. Speaking of exciting times, the big news of the of the meeting was the announcement of the boathouse site and the presentation of a huge amount of work by a number of people. Matt Genova from the Civic Design Center presented the culmination of several years of work on major city plans to increase the connection of the community to the Cumberland. The boathouse will be a large piece of that puzzle as we are able to bring new opportunities to the waterways of downtown Music City! Linked here is the digital version of the Civic Design Centers presentation on the Nashville Boathouse (which can also be seen on Row2k's frontpage from November 18th). David Bailey of Hastings Architecture also presented on their work and inspiration for their renderings of the boathouse. After spending a great deal of time looking at the form of boats, shells and the movements of rowing, they were able to create some beautiful and functional designs that will be a great addition to the Cumberland shoreline. Thank you to everyone who came out to the meeting to vote, and to join in the vision for the collective future of the our Nashville Rowing family! A special thanks as well to the Cumberland River Compact for allowing us to use their space for our meeting. Friday November 6th the trailer pulled out of Hamilton Creek for one last trip down to Chattanooga to wrap up the racing for Fall 2015. With 31 entries across the Masters and Juniors, all were ready for a weekend filled with racing and with hopes of better weather than last year. 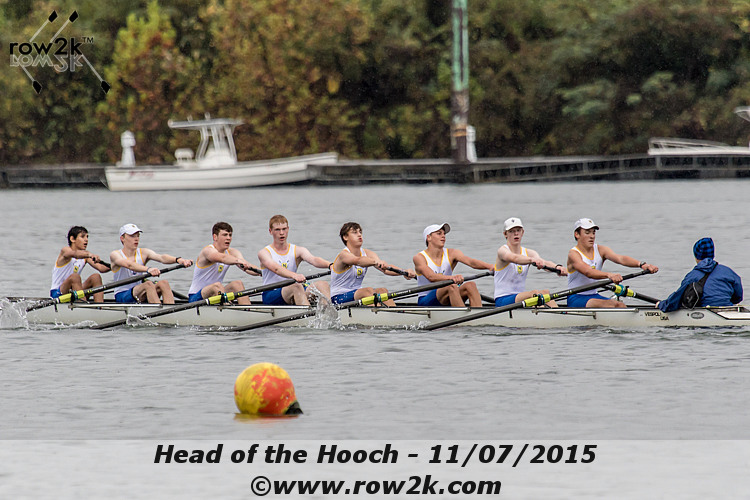 This year's Hooch saw more total entries than the Head of the Charles making for a lot of buzz around trailer lot, and a high volume of boats coming down the course. Some rain and a some wind didn't stop racing for the day, and below are the results from all our events from Saturday. After Saturday's racing ended, many athletes spent the evening refueling and recovering for more racing Sunday. We traded the rain for a bit more wind and some cooler temperatures, but that didn't stop a second strong day of racing. 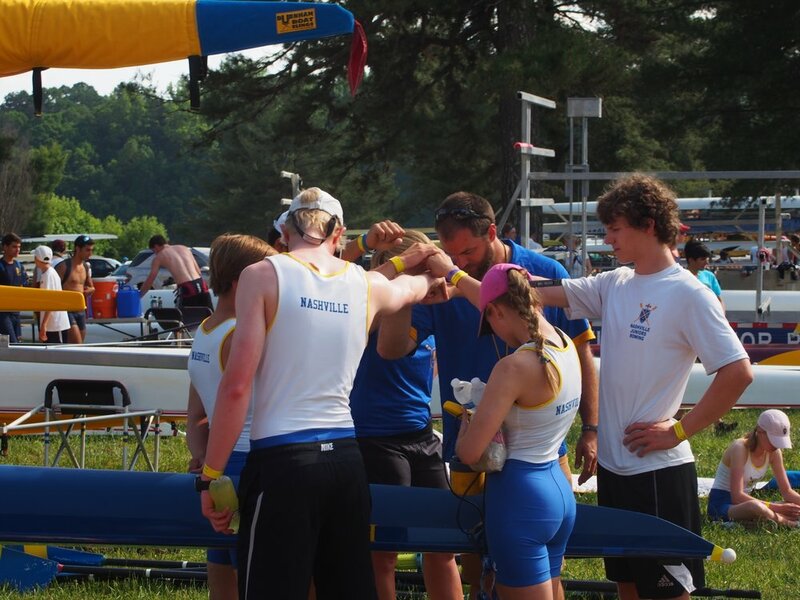 We are proud of all our athletes and how they represented Nashville Rowing on and off the water. Every result this weekend is indicative of improvement not achievement, and we are looking forward to lots of hard work this Winter Season to continue growing stronger and getting faster! At 5 AM on Friday October 15th the ladies of the Nashville Rowing Varsity 8+ met at the airport to make the trip to Boston for the 51st Head of the Charles Regatta. 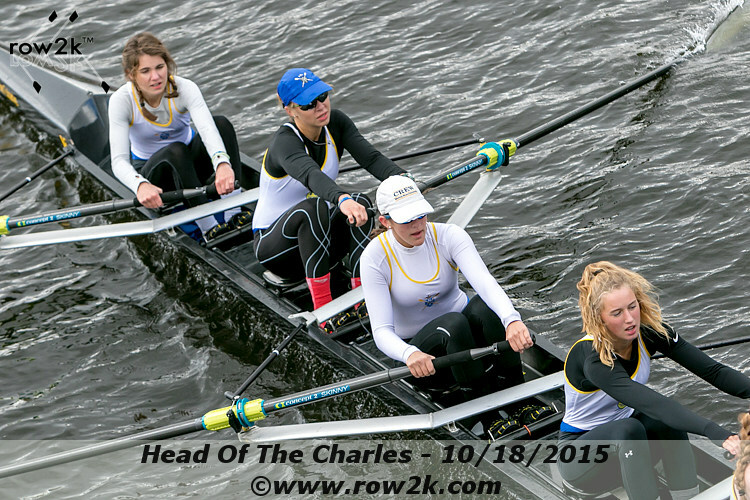 Though it wasn't the first time for some of the girls going to the HOCR, it was their debut in the Women's Youth 8+ event. Coming down Friday morning afforded the ladies the opportunity to practice on the course and to get a feel for the multitude of turns and bridges that the Charles has to offer. Saturday was a chance to check out a few of the big boathouses on the river including CRI, Boston University, and Newell (Harvard Women). If you follow us on Twitter, you can see the ladies in a group picture outside each. We were able to watch several races from the start line on BU's dock, giving a little insight into how the race begins. After watching a few races come down, and checking out the tents at the fitness expo, the team loaded up the van and headed down the river to the Sanderson's house for a big pre-race dinner with Coach Cory's parents. Sunday of course was race day! Even with the chilly temperatures (for the non New-Englanders) the girls were excited and ready to race. Starting 66th of 85 boats meant that our Nashville boat would be right in the thick of things, and our coxswain Ellie Loving would need to steer a strong course to make passes efficiently. As the coaches waited at the final turn, live results not loading, we watched Nashville Rowing shoot out of the Eliot bridge and take the inside of the final turn to overtake the boat next to them and cross the line in 19th place! This finish guarantees a Women's Youth 8+ bid for next year where they will start in 19th! We are very proud of how the boat raced, and even more excited to continue building from in through the end of the fall and rest of the year. We were also proud to watch Nashville Rowing Alum Rosemary Kyne race in the Bates College 8+ that earned a bronze in the Women's Collegiate 8+! We look forward to seeing more and more alums racing with and against each other in the years to come. Masters rower and Board Member Don Sullivan also took the river this weekend in a Georgetown University Alumni boat racing in the Men's Senior Masters 4+ in the Grand Master division. Congrats to Don and his boat who took 47th in their field! Special thanks to our growing cheering section that lined the course and bridges to support the ladies in their race. It is no secret that our strength continues to draw from the family, friends, and the support from those back home following along on the livestream! Check out the link HERE to see the official results and their splits through the checkpoints of the race. Live Feed Archive of the race! Saturday September 19th saw the start to another great Music City Scrimmage. This year we had a full morning of racing with teams from Saint Cecilia, Brentwood High School, Harpeth Hall, Nashville Masters and Juniors, Row Huntsville, and Rocket City! The morning went off without a hitch, other than the occasional customary water skiing wake. The scrimmage has always been a great way to get an early snapshot of lots of different lineups and to see athletes in multiple boat classes before the start of October, and some of the larger regattas throughout the fall. We were happy to see the Nashville Rowing family continue to grow with the Harpeth Hall ladies in their first races with our Juniors, and are equally as excited to see new clubs like Row Huntsville jumping in the mix! Early morning races were able to utilize the full 5k course, despite a head wind. As the morning went on and wind picked up along with boat traffic some of the later flights were shortened to 2.5k, but still just as competitive. For some athletes, this was their first competition ever, while others were lining up with and against old friends.A big thank you to the teams that traveled to the lake to race, and especially to all the parent and rower volunteers who really help to make things run so smoothly. Check out Brentwood HS Broadcasting Club's video the shot during the scrimmage HERE. June 27th-28th Augusta, GA. With a full list of 18 entries in everything from 8+'s to 1x's the Nashville Masters loaded up to head to Georgia for the 2015 USRowing Masters Southeast Regionals. The whole group looked to build on their hard work through the spring season and Dogwood to perform at their peak in Augusta. 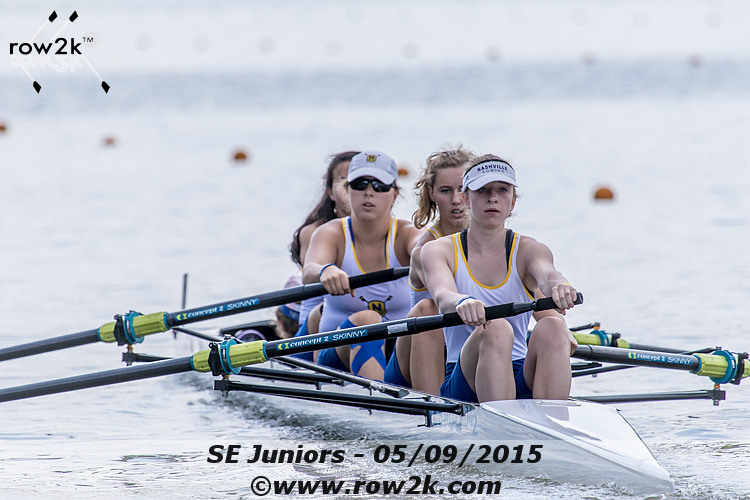 Congratulations to all athletes that competed at Southeast Regionals making for a very successful weekend of rowing. Coming home with all that hardware always makes the drive home a little better no matter how tired you are. Check back soon for updates on the upcoming USRowing Master's Nationals in Camden New Jersey where several members of the Nashville Rowing team will be heading to compete. June and August saw the start of Harpeth Hall's team camps for rowing with Coach Eric and Coach Cory. While the Harpeth Hall program has been rowing on Percy Priest for several years, this would mark the first one that they would be working with the Nashville Rowing family. We are excited with the addition of so many ladies to the program that are eager to learn and will be able to foster a growing passion for rowing in the coming months. The HH ladies will make an immediate impact on all levels of the Women's program, and the number of novices means exciting work for years to come! Along with the Harpeth Hall rowers came a very generous donation to their program of a brand new Vespoli 4+, the "Lux Et Velocitus." The chance to utilize their amazing athletic facilities, most prominently in the winter months, will take the whole Juniors program to a new level of training, and will hopefully make for our best spring season to date! We look forward to all the development, speed, and fast races to come with Harpeth Hall. Welcome to the Nashville Rowing family! Sarasota, FL - The Nashville Juniors Rowing Women's Youth 4+ arrived early in Sarasota, FL for the 2015 USRowing Youth National Championships to acclimate to the heat, practice on the course, and continue getting in tune with each other and their rowing shell. This, 2015, was the first appearance of Nashville Rowing at Youth Nationals, and an exciting one in our second year of existence. The five athletes racing (Caroline Lawrence [cox], Eden Norris [bow], Aine McGinn , Michele Holtkamp , and Abigail Tarquinio [stroke]) and their alternate (Madeline Quinby) were especially motivated to perform well this year after barely missing qualification in 2014 as novices in the Varsity 4+ event by just 1.67 seconds. That motivation proved useful as the boat of young ladies won the USRowing Southeast Regionals, and cementing their continuation of training for 5 more weeks leading into Nationals. Over the three days of racing, the Nashville Juniors Rowing Women's Youth 4+ placed second in their heat, second in their repechage, and then fifth in their semi-final, before earning fourth in the B Final, placing them 10th overall. The entire Nashville Rowing family tuned in at home over the live-feed and constantly expressed support and excitement throughout the tough racing. "We are very happy with how well the young ladies performed this year. I would have liked to peak better after Regionals and coming into Nationals but the boat handled the fast field very well," Head Coach Eric Gehrke expressed, "they put their minds on a goal and achieved it over a short period of time, considering two years ago our program didn't even exist. Our goals now are even higher for 2016 and beyond, and I am excited to coach them towards those plans." For graduating senior captain, Caroline Lawrence, the performance was exactly how she wanted to leave the program, as she knows her legacy with her younger boat mates is to aim high and break down walls. Her, and the rest of our growing group of alumni, are excited to see what Nashville Juniors Rowing can do in the years to come. Two of Nashville Juniors Rowing varsity women rowers, Abigail Tarquinio and Aine McGinn, are representing the United States this summer in International Competition. Both St. Cecilia student-athletes have worked purposefully in the last year to continue improving and earned invites to the USRowing Women's Junior National Team Selection Camp (Abby) and USRowing Women's Junior High Performance Camp (Aine). Abby, a rising Junior, made the most of her time during Selection Camp and earned a seat in the Women's 8+ going to Rio de Janeiro, Brazil to represent the United States against the best in the world. This is not Abby's first experience racing internationally as she won Gold the CanAmMex 8+ and 4+ last summer (2014) against Mexico and Canada. She was one of 37 girls invited to try-out for one of the three camp boats traveling to worlds - the 4-, 8+, and 2-. In order to make the 8+, Abby put to good use the habits she learned on the Nashville Juniors Rowing program - most importantly that you are an athlete 24-hours a day and must treat your body and mind as such. Once in Rio, Abby and her boat-mates pushed hard all weekend placing 3rd overall, winning a bronze medal, behind Germany and Italy in the Grand Final. Photos of the Women's Junior National Team training in Princeton, NJ where Abby is 3-seat in the 8+ are linked HERE. Articles about the Junior National Team's success in Rio on Thursday, Friday, and Saturday are linked. Aine, a rising Senior, earned a seat in the same boat that Abby raced in last year (2014) by making the CanAmMex 8+ for this summer (2015). Aine was one of 30 girls invited to try-out for the two levels of High Performance Camp - CanAmMex and Club Nationals. Aine earned her place in that top boat of Camp and made the best of it by winning Gold in the 8+ and Silver in the 2- B. "We are very proud of how all our athletes are representing our young club all over the country and world this summer," noted Head Coach Eric Gehrke, "Abby and Aine have done a particularly great job of rising to the occasion and earning seats in international boats. We could not be more excited for the experience they will bring back and share across our program in order to help our entire family grow." On Thursday May 7th the athletes arrived in Gainesville, GA for the 2015 Southeast Youth Championships. For many it was their first time at a regional championship, and for some they would be returning after racing in Sarasota a year ago. Practicing on the course Friday allowed the crews to get a feel for the course and work out their race plans accordingly. They also got a taste of the high heat that we hadn't felt in Nashville for some time. Saturday morning would bring the start to a weekend of exciting racing with the Women's Youth 2- taking first place in their heat with the fastest time out of all the boats qualifying for the final. The Women's Varsity 4+ would come down the course next, again winning their heat with the fastest qualifying time, and a commanding 14 second lead over 2nd place in their heat. The Men's Varsity 4+ continued the trend by winning their heat to move on to the semi finals in a strong position with a 5 second lead over the second place boat. Next to come down the course would be the novice boats. The Women's Novice 4+ won their heat by 15 seconds, earning them a spot in the semi-finals with several fast boats out of the other heats. The Men's Novice 4+, came from lane 1 and overtook a very competitive field to win their heat as well by 7 seconds. After some issues at the start line and a petition to the Head Referee by Coach Eric, the Women's 2V 4+ was granted a spot in the finals in Lane 7, and a challenge to prove that they deserved to be their. The Men's Varsity 4+ would have the first semi of the day, which included 5 of the fastest times from the morning heats. Despite a strong race, the Nashville boys were narrowly edged out by Atlanta for the 3rd qualifying spot. The next semi of the afternoon was the Women's Novice 4+. The girls would quicklyseparate themselves from the pack with Miami to take 2nd by almost 20 seconds over the 3rd place boat. The Novice Men's 4+ ended Nashville's racing for Saturday by again proving that they came to Georgia to race, taking 1st place in their semi in a fight with Triangle Rowing. Entering Sunday's racing Nashville Rowing would have 4 out of 5 boats qualified for their respective grand finals. Sunday would start off with a final anticipated by many for 365 days. After finishing 1.67 seconds out of qualifying for Nationals last year, the Women's Varsity 4+ pulled up to the start line ready for a different outcome. The Nashville boat blew down the course taking a move to break free from Miami and the field to take 1st place by 5 seconds and with it an automatic bid to Youth Nationals! The Women's Novice 4+ was up next, and would find themselves coming into the last 500 meters 3 across with Miami and Asheville Youth. In the epitome of a photo finish, the Nashville 4+ took 3rd to Asheville by .016 seconds. It was without a doubt the hardest they had been pushed all season, and we look forward to seeing them line up again a year from now at Southeast Regionals again. The Men's Novice 4+ found themselves in one of the tightest grouped finals of the day, with many of the qualifying times only a second or two apart from each other. Having earned their spot in Lane 3, the novice boys would race down to the wire, being edged out by Atlanta in the last few meters, still earning 4th place when all was said and done. Out to prove their place in the finals, the Women's 2V 4+ came out of the gates hot in lane 7. As they neared the final 250 meters and the cheers grew louder, the ladies opened their lead to a commanding 13 seconds to take 1st place. A fitting end to this boat's season! This was without a doubt a proud weekend for the whole Nashville Rowing family. The cheers from our athletes, families, friends and coaches echoed across the finish line, and no doubt hearing "We are, Nashville!" breathed some fire into the legs of our rowers as they entered their sprint. Now it is on to Nationals for the Women's Varsity 4+! Congratulations to all the athletes that came out to put on their Nashville unisuits to race this weekend. A special thanks to all the parents and spectators who cheered everyone on from the shore, you all help to make our family what it is! This March marks the start of the newly formed Tennessee Sprint Series. The series of races was crafted by the coaches to provide consistent and controllable competition throughout March and April, leading into Dogwood Regatta and Southeast Regionals. The structure was set up to give each of the four TN Rowing programs (Nashville Rowing, Chattanooga Juniors, ETRO, and Atomic Rowing) the opportunity to host one weekend of a 4 weekend progression of races as their training plans build towards championship racing. Each weekend offers a slightly different format allowing each program the ability to race athletes across boat classes and begin to approach the boatings that will race at Dogwood and beyond. With regular race results going up on Row2k, we hope to continue growing the sport of rowing in our region both in visibility and competitiveness. With each weekend, several other programs joined in for the racing. This included Masters from Lookout Mountain, ORRA, and Rocket City, as well as Juniors from The McCallie School, Rocket City, and The Baylor School. With a large volume of races, it has been great to get athletes racing across multiple boat classes, and against consistent competition. Below are links to the results to the first two weekends of the Sprint Series, but please be sure to check back for updates wrapping up of The Tennessee Sprint Series in the coming weeks! On Sunday March 1st, Abby Tarquinio, Michele Holtkamp and Anne Campbell joined the 2,200 other entries at Agannis Arena in Boston, MA for the C.R.A.S.H. -B Sprints World Indoor Rowing Championships. As the name implies, this event included athletes from around the globe as well as across the country! For Nashville Rowing, and all three of these ladies, this was a first time experience racing at this event. All 3 had competed and won gold in their respective events at the Tennessee Indoor Rowing Championships earlier this winter, and the prospect of expanding their competition was an exciting one. A great deal of training and preparation went into the days and weeks leading up to the moment they sat down on those ergs in Boston on Sunday, and all 3 came to race. Many of our greater rowing family watched the live stream of the races from here in Nashville, and we are all proud of how Abby, Michele and Anne represented themselves! Below are their results along with the links to the the official pages. Replays of the races can be found here. Racing started early on Saturday morning for Nashville Rowing at the TN Indoor Championships, and continued late into the afternoon with strong performances across the board. After several months hard erg training, it was great to be able to compete with athletes outside our usual training family. With 25 medals overall, and 44 PRs it would be an understatement to say that the coaches were all proud to be wearing Nashville Rowing's colors all day. Congrats to the medal winners below, and to all the athletes who made the trip to put down their best on the erg this weekend! January 15, 2015 - After joining the Nashville Rowing Juniors program last year, Eden Norris and Michele Holtkamp saw an opportunity to expand rowing's exposure at Brentwood High School. In order to share the sport they fell in love with last year with their classmates, the girls decided to form a Rowing Club at BHS. After the club's initial meeting, the girls also set up a Learn-to-Row day to give those that expressed interest the chance to see what being in a boat was all about.